These days, emojis are as essential to online interactions as an alphabet. So once Star Wars finally entered that world with its own app, it became essential to get in on the craze. Enter Truck Torrence, an artist hired to make the cutest versions you’ve ever seen of a galaxy far far away. If the name Truck Torrence doesn’t sound familiar, that’s the point. He’s better known by his monicker, 100% Soft, which not only serves as a nom de plume—it’s a personal mantra. “I like everything to be kawaii and concentrated down to the core elements of what makes a character or object distinguishable or cute,” he said. That, along with his concentration on pop culture, made him a good fit for Star Wars emojis. Before that though, he had to get discovered. Initially, the plan was to make emojis fans could tweet exclusively during Star Wars Celebration. Those ended up being C-3PO, BB-8 and the new Force Awakens Stormtrooper. The venture was such a success they did it again for San Diego Comic-Con (this time, it was Kylo Ren, Kylo’s saber and Captain Phasma). The project reached its peak last week when the Star Wars app updated with 52 emojis, which include characters from The Force Awakens, both the original and prequel trilogies, as well as Star Wars Rebels. After being contacted by Lucasfilm, Torrence figured things would be very secretive. “I sort of imagined when I started the job that I’d have some helicopter fly me to Skywalker Ranch where I’d be escorted to some underground bunker, surrounded by security guards while I looked through a library of images watermarked with my name,” he said. That was not the case. “They ended up being pretty chill about everything.” Since the first teaser was already out, they simply sent him some key art to get more detailed looks at some of the new characters and ships. Here’s an example of the process for creating a single emoji. With more Force Awakens characters, ships and reveals on the way, Torrence didn’t know if he’d be asked to make additional emojis when we spoke to him. He hopes so of course, because Star Wars, to him, is as big a part of his life and his art. For more on Torrence, visit 100soft.us. 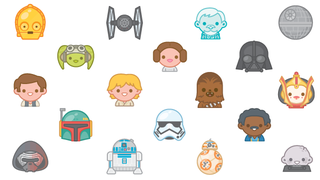 To get all the emojis, download the Star Wars app on ioS here and it’ll be coming soon for Android.